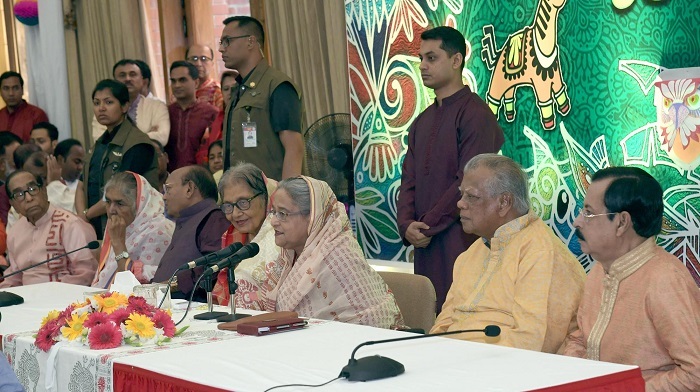 Prime Minister Sheikh Hasina on Sunday called upon all to work in unison to build a hunger-and-poverty-free developed and prosperous Bangladesh being imbued with the spirit of the liberation war. The premier made this call while exchanging Bangla Nabobarsho greetings with the leaders and workers of her party at her official Ganabhaban residence this morning. “We will ensure welfare of the country and nation through our all works and thus will transform Bangladesh into a developed and prosperous nation,” she added.